Sabrinas Haus. 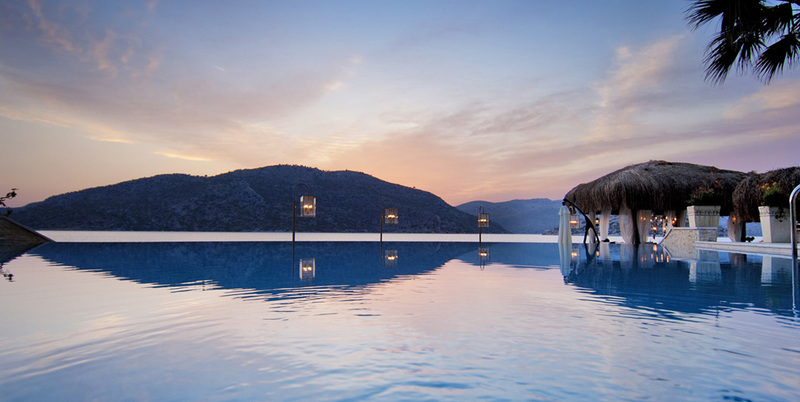 A chic luxury Adult Only retreat on the Aegean shore Bozburun Datca Turkey. A chic luxury Adult Only retreat. Bozburun, along the sleepy Datca peninsula on Turkey’s Mediterranean coast, is far-flung and remote, accessed via a picturesque and quiet coastal road. Yet you are minutes from delightful restaurants and cafes, and the equally charming villages of Selimiye and Orhaniye. There is even a Greek island, Symi, shimmering in the blue haze across the water, just 45 minutes away by boat. Your hotel is the landmark that makes Bozburun a preferred destination for Turkey’s elite and their international circle. Sabrina’s Haus is a charming, quirky, classically romantic little hotel set right on the waterfront. The hotel is built around a series of decks, with direct access to the sea and wonderful views over the beautiful Bozburun bay. For our collection, we have chosen only eight of the 16 rooms at Sabrina's House: These are spacious and individually styled suites, each with a splendidly draped four-poster and with Eastern-inspired décor throughout. The views from all rooms – and indeed all over the hotel – are stunning. With the island of Symi as the backdrop, the sea stretches away to the horizon all around you, while the graceful coastal cliffs loom behind. At dusk, with cicadas chirruping their love calls from the bougainvillea, and a cool cocktail at your elbow, you may be forgiven for thinking that the world has no more to offer.